The international students who study in USA has the opportunity to work on F-1 visa by applying for EAD for OPT Jobs in USA i.e. Optional Training Program. But that is not in case of people who want to work in USA, they have to apply for H1B visa and search for employers who sponsor them to work in USA. The H1B Visa allows the companies to temporary employ the foreign employees for the specialized job designation. 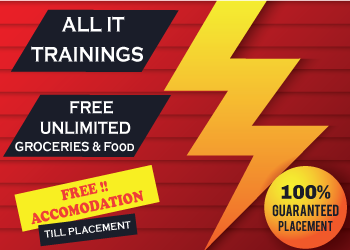 They can hire the non-residential worker in the specialized occupations like architecture, engineering, mathematics, science, and medicine which requires a technical and theoretical expertise. Under the H1B visa, the US Company can employ a foreign worker for up to six years. For every fiscal year there is a limit to the amount of H1B visa being granted by the US embassy the current scenario gives 85,000 H1B visas. The USA embassy provided 65000 H1B visas every year with additional 20,000 visas for those candidates who have completed their master’s or PhD in USA. The chances for certain applicants to face the H1B rejection keeps the applicant nail biting until the result are announced. Majority get their visa approved while few are left behind in the queue waiting for the approval or disapproval of their visa application. The company will sponsor candidate’s H1B visa only when the candidate’s join them and after a certain time duration. One cannot demand company to file H1B visa prior to joining the company. And thus it is advisable to search for those companies that sponsor h1b visa and also have filed the H1B visa application in past. H1B visa is more like a lottery where is no sure guarantee that the applicant will get the visa for sure. Candidates apply for the H1B Visa in USA but face H1B rejection the main reasons behind that are lack of knowledge about H1B visa application process and H1B visa rejection reasons. Here you find all the details. The denial of the visa occurs if the employer who is filing the petition for the candidate does not seem to be well established. If the embassy finds the employer unreal then it has the power to reject the visa of the candidate. The visa of the candidate is refused because the employer has failed to justify the requirement needed to give the proof. The employer should demonstrate the hiring capacity and have the earning enough to be capable to pay the hired employee. An established petitioner can give documentation, like a tax number, tax returns or monetary statements. Insufficient documentation can sink the application right on spot. The petitioning employer should even be able to offer documentation of getting an established location. This could embody website printouts, brochures, pictures of the employer’s premises, and any licenses or stock certificates if necessary. If there is lack in showing the proper relationship between the employee and the employer then the US embassy can doubt the intentions and may refuse to approve the visa. The Visa office would doubt if whether the employee will actually work for the petitioning company or not. There may well be misconception that the employer is making an attempt to get around the rules by acting as “job shop”, inserting workers on subcontracting assignments. The evidence like purchase order, contract agreement or a clear statement intending that only the petition filer employer has control over the employee should be submitted by the petitioner as a proof. Failure to incorporate any of those within the initial visa petition might lead to a denial of visa application. An H-1B visa is often denied or refused because the worker/beneficiary does not have the required education, or the offered employment does not meet the “specialized knowledge” requirement. The beneficiary is needto have at a minimum a bachelor’s degree, preferably in the field of offered employment. The beneficiary should also establish, with assistance from the employer, that he or she has specialized knowledge related to the job that has been offered. Although evidence of the B.A. is sometimes enough by itself, in other cases the employee may need to provide such evidence as a thorough resume and experience letters from previous employers to avoid visa rejection. The candidatewho applying for the H1B visa has to prove the admissibility to the country, the legal proof for having the valid entry in the country whether they have applied for direct H1B petition or COS of opt students looking for jobs after opt completion in USA. If the employer has submitted the H1-B visa petition the agency would definitely issue Request for Evidence (RFE) before a denial of the visa. The VO has always given up the visa to the maximum visa seekers but minor chance lead to the visa rejection. USCIS request will ordinarily either state a listing of documentation that has to be provided or a list of questions to justify in a letter response. The request will give a deadline by which the response is due. If the recipient does not respond by the deadline the USCIS will deny the case and reject visa application. The applicant should always be well prepared for their H-1B visa interview the same way as a job interview.Everything from their overall attire to their tone of voice will be critiqued during the interview. Candidate must have good communication skills and confidence. The more professional you present yourself, the more you have the chances to get passed. And if you are worried about getting the H1B visa and want to appear there as fully prepared, follow some H-1B visa interview questions & tips.One should be prepared to answer questions irrespective of whether interview is to Consulate for a new H1B visa or for an H1B renewal or extension. Other relatives who are currently residing in the U.S.
Another reason might be the recession or the unemployment for the USA citizens itself. The hike of the H1B rejection or the approval can be seen based on the trend of the economy of the USA. 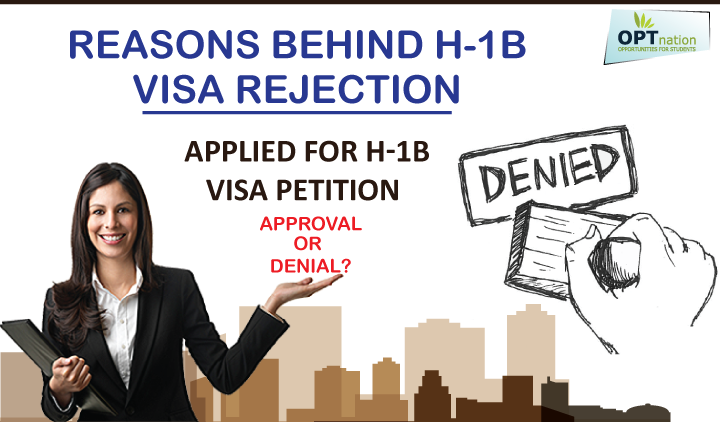 If there is a H1B visa rejection then the advantage is that the candidate can again apply for the same next year but it is daunting process because the candidate has to follow the entire filing application inclusive of convincing the company. Again H1B visa is under lottery system. There is no guarantee also that you may get your visa this year. But that does not matter. Once you join the company, you get your H1B visa and you can hunt for better jobs and apply for H1B visa transfer to another employer. But you need to be very careful, through that period. You have to be positive and searching for companies sponsoring H1B and be patience while applying for H1B jobs in USA . OPT Nation is world’s no 1 job site for OPT/CPT and H1 B candidates in USA for finding the latest jobs according to their profile and desired location.